One running club; two very different men. A race to end all races. Barry Hare, Wrington running champ. Fit, popular, and above all, fast. Toby “Tortoise” Gollop, eater of doughnuts. Look up ‘relaxed’ in the dictionary and you’ll see his picture. 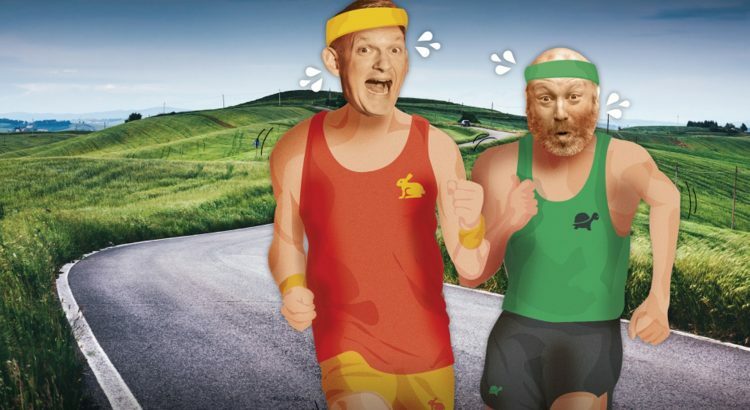 Told entirely in rhyme and song, this promises to be an epic tale of romance, redemption and rural running rivalry that you’ll never forget. Bl**dy brilliant. Excellent writing, wonderful singing and an astoundingly well developed sense of humour. Fabulous evening’s entertainment! Wonderful way to spend a Tuesday night in the pub. Brilliant! Fantastic opportunity to have theatre in our local pub! A man. A cow. A whole shed of trouble. Trevor loves Judy. Judy loves Trevor. They’re best mates. Trouble is, Trevor’s family don’t approve. They think that Trevor should leave his prize cow alone and get on with looking after his farm. 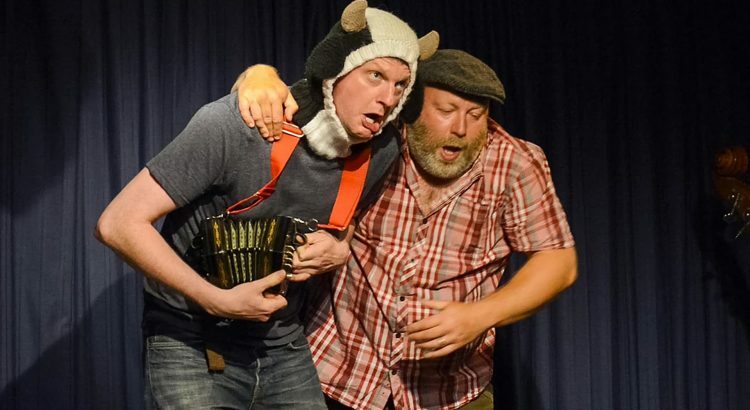 And then Trevor gets some bad news… This hilarious comedy was written, and is performed, in rhyme and song by North Somerset’s very own Living Spit, and with a multitude of agricultural cliches and farmyard frolics. Bacon Construction – three builder brothers with a line in exclusive dwellings of traditional construction – straw, wood and brick. An exciting new development on a greenfield site on the outskirts of “Little-Muckle-in-the-Wold’. But the locals aren’t so sure. And then one day there’s a visit from the building inspector, Miss Wolf. Told entirely in rhyme and song, Living Spit put their their unique spin on ‘The Three Little Pigs’. With porcine puns and more rural rambunctiousness than you can shake a stick, straw or brick at, this grown up fairy tale will have you huffing and puffing with laughter.